Despite it’s deficiencies I don’t know a more exciting period to be into sequential art than the early 90’s. The buzz in the local store was always a rush to walk into. Great post Mike! It was certainly an exciting time. I understand the speculation bubble, but even as an adolescent I couldn’t understand the mega-popularity of artists like Liefeld. Even the best of the Image bunch were mediocre. I bought one of each issue and then got a sixth to open and read. I remember the price guide in Wizard promising that they were worth serious money for ages afterward. They later went in a lot of comics my dad sold for $5. As recently as two years ago my LCS had stacks of sealed copies of this and at one point set them in a counter display as a conversation starter and object of derision. 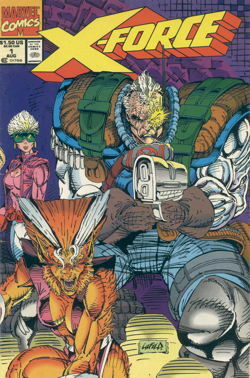 I never could get past the realization that Cable’s upper arm was bigger than Tabitha. I think I’ve seen that! no, but I DID have a couple packs worth! Collectable “Printer’s Error Variant” edition! Look at that Liefieldian cross-hatching on the crotch. 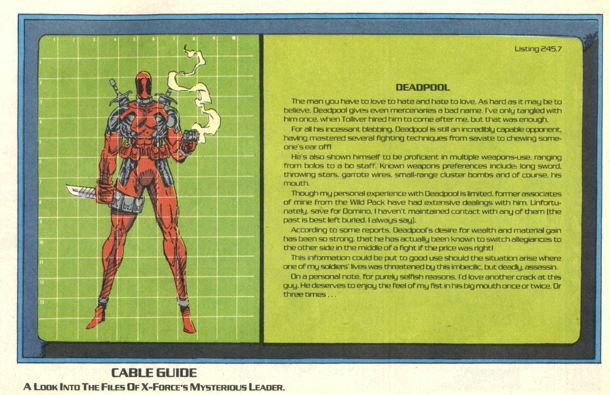 Say what you will about Liefeld & X-Force, but new mutants under Louise Simonson had dipped to an all time low – so when Cable hopped onto the scene, he really gave that book energy – it felt exciting and new. Obviously it never really went anywhere, and was just another casualty of the Image crew’s takeover and desertion of X-Men. I bought X-Force #1 a couple months ago, sealed, for 2 bucks.